Here’s the thing about Patrick Ness, he writes some pretty strange books sometimes. But they always intrigue me and I always find a deeper message in them. And I always enjoy them, completely. The Rest of Us Just Live Here was no different. The concept behind this one is pretty clever. You know all of those stories with a huge supernatural setup with a hero or heroine having to defeat the… whatever supernatural aspect you want to fill in the blank with? Okay so what is happening with those characters in the background you just get a glimpse of? The ones not directly involved with saving the day? That’s what this book is about. A group of teens just trying to survive the end of high school and figuring out what to make of their lives… hoping the school doesn’t blow up in the process with the latest issue to breeze into their town. This town has seen its share of vampires, Gods, and soul-eating ghosts but hey, it’s the indie kids everything happens to. So when Mikey and his friends notice a weird blue light in the forest and an indie kid seemingly running for his life, they think nothing of it, hoping they can graduate before anything too bad happens. But don’t let that fool you because this story reads much more like a contemporary fiction, in my opinion. Yes, each chapter would begin with a super short paragraph summary of what was happening with that crazy supernatural story we see in the background, and yes there was some overlapping, but then we would delve into what was directly going on with our main characters as the focus instead. Each character has their own set of obstacles to overcome but our focus is on Mikey, the narrator. He is dealing with some major anxiety and OCD that has reemerged. With graduation approaching, his mother’s new political campaign, and the clock winding down on time he has left to confess his feelings for his friend Henna, it is a lot to handle. He has a great relationship with both of his sisters and we see a lot of interaction among them. Mel is not only his sister but also in his close knit group of friends, going through her own anxiety and issues. Jared is the gay best friend, who also happens to be part God. And then there is Henna, the crush, who sets her eyes on the mysterious new boy who comes to town. I really loved how each character fit into the story. The protective nature they had for each other was so admirable. Strong bonds of friendship can really make a story beautiful and I found that here. I really don’t want to hit the plot much more than that. But I will say that Patrick Ness is brilliant and really got me with such smart storytelling and a unique spin on the classic coming of age story. The flippant and casual attitude in regards to some of the supernatural occurrences was almost comical at times and really balanced out the seriousness going on with Mikey. I felt like there was a strong message when I finished this book. One of friendship and bonds but also accepting help and learning that there isn’t always an easy fix. Sometimes you have to work to overcome your fears and insecurities. But you can do it. The Rest of Us Just Live Here is the perfect novel to pick up if you are looking for something fun but a little different. It’s a quick read and has a strong message to go with it. The premise of this sounds amazing. We need more books where the protagonists aren’t ‘the chosen ones’. 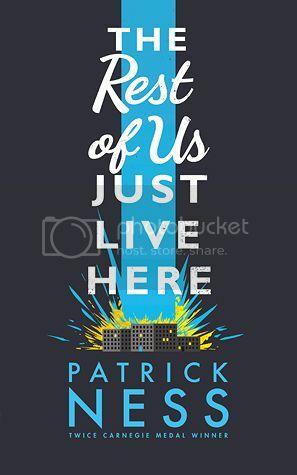 I haven’t read anything from Patrick Ness before, and I don’t know if I will, but I do want to check this one out because it sounds so intriguing. Great review, and glad you loved this! Glad to see you enjoyed this too! I was a big fan of Mikey and the awesome friendships in this book! And yes, totally loved the way Patrick Ness played out the supernatural component so nonchalance. Great review, Sara!